When a BVMF contract is in an auction state (e.g., Pre-open, Intra-day) the TT Gateway sends auction related information to X_TRADER which is displayed in the Market Grid. Tip: Create a workspace so that you can quickly view the information you need when a contract goes into an auction state. 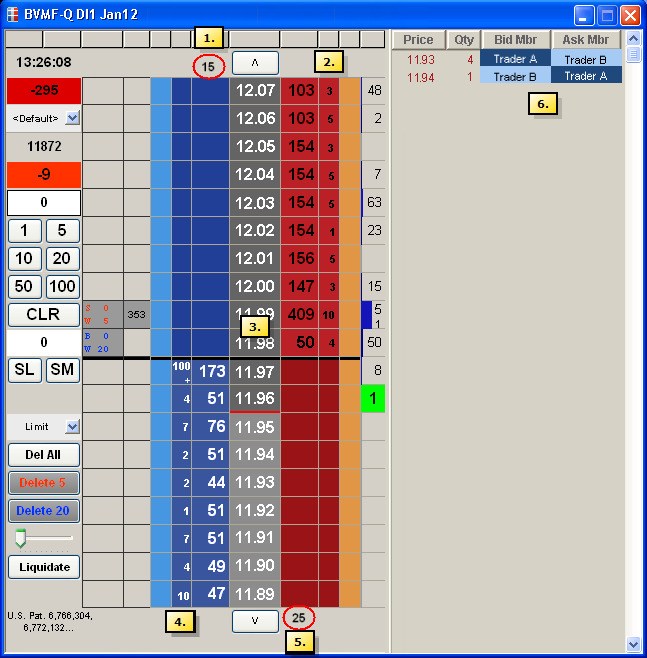 Click to switch between an aggregate and detailed view in the Market Grid. Left-click to view aggregate depth. This view displays the number of buy and sell orders at each price level. Right-click to view detailed depth. This view displays the detailed depth (Market By Order) and counterparty at each price level for the selected contract. Refer to Viewing Market Depth. Displays the quantity of buy orders at each price level. Displays the quantity of sell orders at each price level. Displays the counterparty information of the bid member. Note: The counterparty member only displays when viewing detailed depth. Displays the counterparty information of the ask member. Displays the total quantity of resting market buy orders. Displays the total quantity of resting market sell orders. Displays the Theoretical Open Price (TOP) of the contract. Note: Net Change and P/L calculations are also updated based upon the indicative price when an indicative opening price is present. Displays the Theoretical Open Qty (TOQ) of the contract. Displays the auction imbalance quantity. A positive value displays green and indicates more buyers than sellers. A negative value displays red and indicates more sellers than buyers. Tip: Use the ImbQty field to determine if there are more buyers than sellers or vice versa at each price for a given contract. Displays the status of a contract. When an intra-day auction occurs the column displays AUCT and the cell color changes to yellow. When a contract is in the pre-open phase the column displays PRE-OPEN. When a BVMF contract is in an auction state (e.g., Pre-open, Intra-day) the TT Gateway sends auction related information to X_TRADER which is displays in MD Trader. The total quantity of resting buy market orders displays at the top of the Buy column. Displays the number of orders associated with the reported market depth. The exact number will display up to 100, after that the number rounds up with an estimate (e.g., 100+, 200+, 300+). Note: You can add the Number of orders columns from the Display tab within Properties. Note: For information about changing the Last Traded Price colors, refer to the MD Color tab. The total quantity of resting sell market orders displays at the bottom of the Sell column. Displays the time, price, quantity, and counterparty member of each trade.